You can tune geocoding performance by adjusting the number of CPUs that are used for geocoding, the number of candidates that are returned, and the number of suggestion candidates that are returned by your locator. The sections below will go into more detail on how to tune your locator to fit your performance needs. To best utilize this setting, you will need to think about the machine you will be using for geocoding and determine the number of cores available on your machine that you can devote to a geocoding job. Geocoding has the ability to utilize all of the cores on your machine to complete a geocoding job more quickly. By default, this value is set to a smaller value that should be able to work on any machine regardless of the number of cores available, but it can be configured to use more cores if you know you have them available. It can be set to Auto to detect the cores on your machine and optimize it for your machine, or you can choose to devote a specified number of cores to geocoding if you know you need to leave some other resources available for other applications. 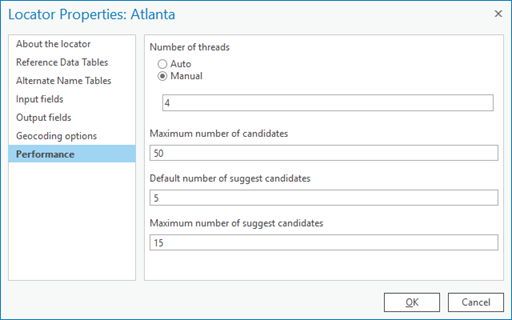 If you plan to share your locator to ArcGIS Enterprise, it is recommended that you set Number of threads to 4. If you find that geocoding is taking a long time and you are also getting high-quality matches, check that the Maximum candidates property is not set too high. Assuming you are getting good results, performance can be improved by generating fewer results and focusing on the top few. If you find that it is taking a long time to generate autocomplete suggestions as you type, it may be because the locator is attempting to find a very large number of Suggest candidates for each letter of input that you add. Setting this value to a lower number can help suggestions be generated more quickly and make the experience feel more dynamic.